I just celebrated another birthday in January. I've never been big on birthdays, especially mine. I think that's because I love Halloween, Thanksgiving and Christmas so much. After that it's a downhill slide into January. I don't really rebound until the end of the month. Presents go the same way. We now have a lot of STUFF accumulated over the years. So it's not like in the early years when there were so many things I needed. My husband usually just gets me a well-loaded Starbucks card for Christmas and my birthday which I love using when I'm out for coffee with friends. However, this year he decided to ask if there was anything special I would like. At first I said no. Then in a spark of genius I changed my mind and said yes - I wanted a vegetable spiralizer. Canadian Tire had the Starfrit model for only about $35 (just checked and it's now around $40). That was a great price as I wasn't sure how much I would use it. 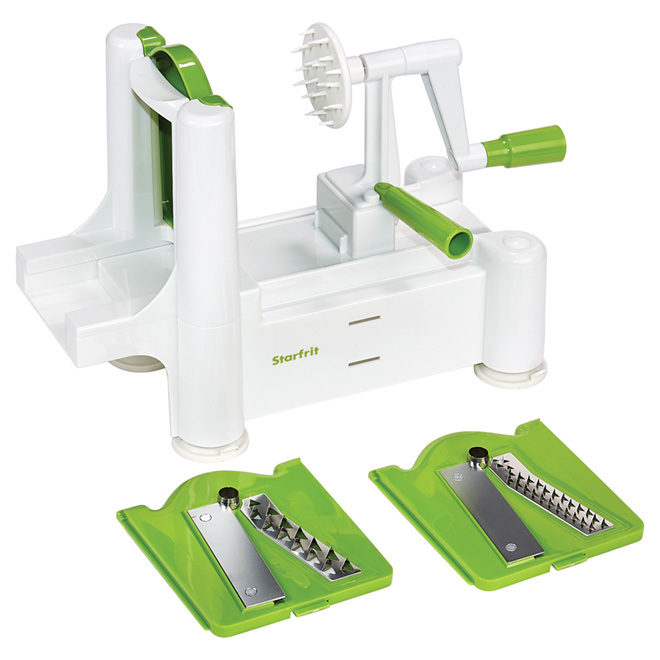 It came with 3 blades - slicer, small spiral and larger spiral. I can always upgrade in the future if I use it heavily. I already had a first recipe to try - Spiralized Veggie Thai Noodle Bowls. I like the idea of having some real noodles in to fill you up, but using the spiralized vegetables to keep the amount of carbs to the minimum. I'm not big on Seafood, so I switched the shrimp out and kept it easy by using a precooked deli chicken. You can view the original recipe on a blog called Sweet Peas and Saffron using shrimp - click HERE. The one thing I would done differently is break up the long vegetable spirals a bit to make it easier to eat. I already broke the noodles in thirds for the same reason. If you like your noodles long and slurpy, then leave them both intact. I've used my spiralizer several times since then and always with good results. My family has never been big on summer squash, but seem to enjoy them spiralized. So they're back in regular menu rotation. The spiralizer parts are easy to clean by just rinsing with water. I did find it a just a bit difficult to get the hard carrots moving through without the base sliding. The little suctions on the feet aren't strong enough. But after playing around a bit I found a technique to make it work. Enjoy! Blend together all peanut sauce ingredients and set aside. I love a blender or small processor, but you can also stir or shake it by hand. If you do it by hand, it helps to warm the peanut butter for a few seconds in the microwave. Prep all the vegetables. Remove skin from the deli chicken. Then remove meat from bones and tear into bite size pieces. Place the first 4 ingredients in a large bowl. Cook the spaghetti noodles according to package directions. When pasta is cooked through, drain thoroughly. Combine the warm noodles with the vegetables, chicken and peanut sauce. Toss well, place in serving bowls (I love large individual white oval soup/stew/pasta bowls). Sprinkle with green onion and crushed peanuts and serve.